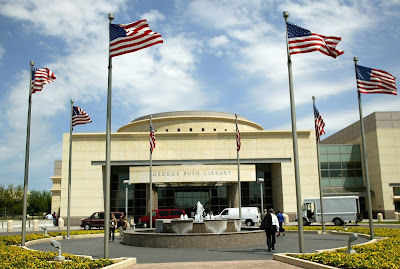 I won't write a full post on George Bush Presidential Library, simply because it will read too much like a tourist guide or be politically charged (renaming Jersey Street to George Bush Drive before Clinton even finished his first term is a particular sore spot for many area non-conservatives). Nor will I have any newspaper clippings or other material on it (there is literally enough material for a website in itself). All I have is some statements about the museum from 1997-2007 and a particular favorite exhibit of mine. It was a pretty heady time to be living in Aggieland at the time (1997-2002). Although the Bonfire collapse and September 11th happened in this time frame, development was taking off in Rock Prairie Road, the University Drive and Harvey Road restaurant rows were building up, and many buildings--the new College Station Library, Reed Arena, and a few others all opened up. At least the construction turned George Bush Drive West from a bumpy two lane road (similar to Luther St. West now, by all accounts) into a smooth, fast, four-lane avenue with a median.